Hank’s offers service after the sale & has since 1964. With a full staff of year round mechanics, Hank’s keeps you on the water. 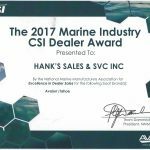 We have earned numerous national CSI awards & dealer of the year awards. Our staff has over 173 years of marine service experience. We stock a large selection of parts and accessories! Hank’s has multiple inside storage facilities to keep your boat looking great for years to come. Hank’s offers full winterization services, on water service, pickup & delivery. We service lake Springfield, lake Petersburg, lake Decatur, lake Shelbyville, lake Sangchris, lake Coffeen, lake Hillboro, lake Lou Yaeger, Governor Bond lake, lake Taylorville, Otter lake & Sunset lake just to name a few. Hank’s provides service for your Mercury motor, Ranger boat, Four Winn’s, Lund and Avalon pontoon boats. Give us a call with any questions or fill out the form and we will get back to you shortly!